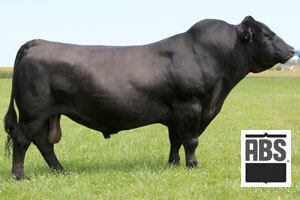 China's Dam: Pine Hill Jenna 222T is a direct Daughter to the timeless Rito 6I6 "The Disposition Bull", a sire known for his broody, gentle natured daughters. From the very beginning, she has tied together an impressive string of outstanding calves that have consistently dominated our herd in both production & profits. 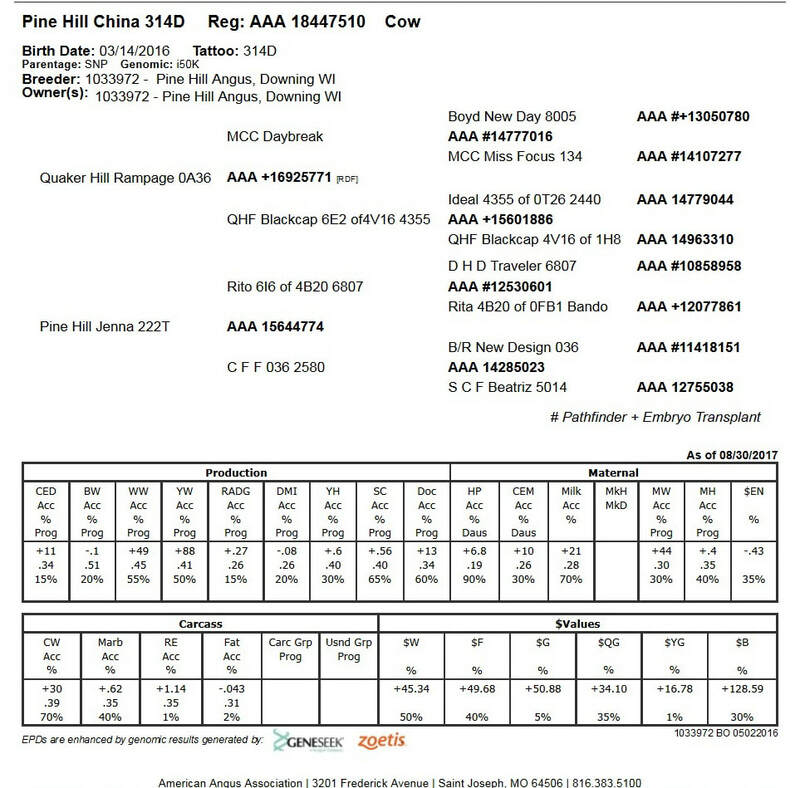 Her 1st calf (heifer) Pine Hill China 225W - earned a 106 Weaning Ratio and a 108 Yearling Ratio. Several of her calves show HD50k DNA Genomics scores ranking in the Top 1% for Docility, Top 5% Feed Efficiency, Top 20% for EVERY other trait. Her 2nd Calf - (heifer) Pine Hill Krysta 35X - covered all the bases and never made a mistake. After all her weights and ultrasound were reported, her EPD’s placed in the top 10% or better for every important trait. 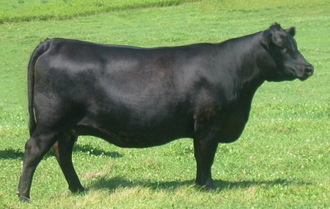 Her record is: Weaning Weight 686 pounds (108 ratio). Yearling Weight 1044 pounds (110 ratio). Ultrasound: 7.85 percent IMF (108 ratio), 11.2 inch Ribeye (109 ratio). 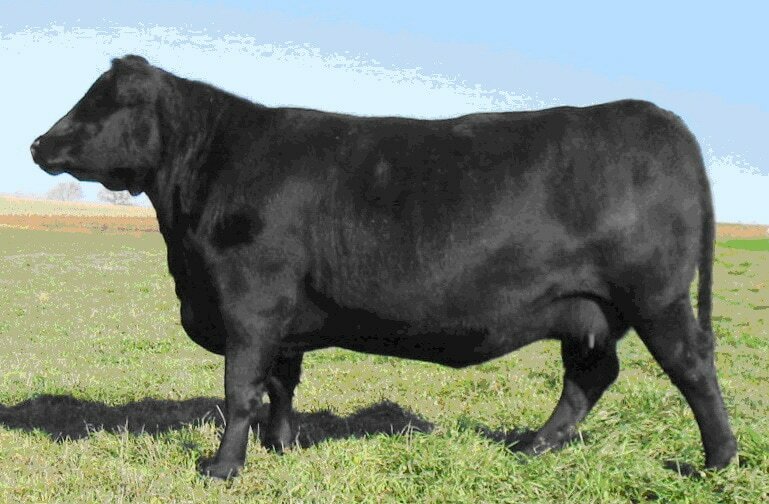 Her 3rd Calf - (heifer) Pine Hill Cindy 57Y - sold as a bred heifer - a very fancy heifer that finished our "Pine Hill Angus & Friends" auction as the #1 high-selling female, purchased by a breeder from Milwaukee who specializes in show cattle. Her 4th Calf - (bull) Pine Hill Objective 323Z displays a Weaning Weight 764 pounds (108 ratio). Yearling Weight 1247 pounds (106 ratio). Ultrasound: 6.06 percent IMF (114 ratio), and a 14.8 inch Ribeye (109 ratio). Ranks in Top 1% for $YG (Yearling Gain) - Top 5% $G (Gain) - Top 15% $F (Feed Efficiency). 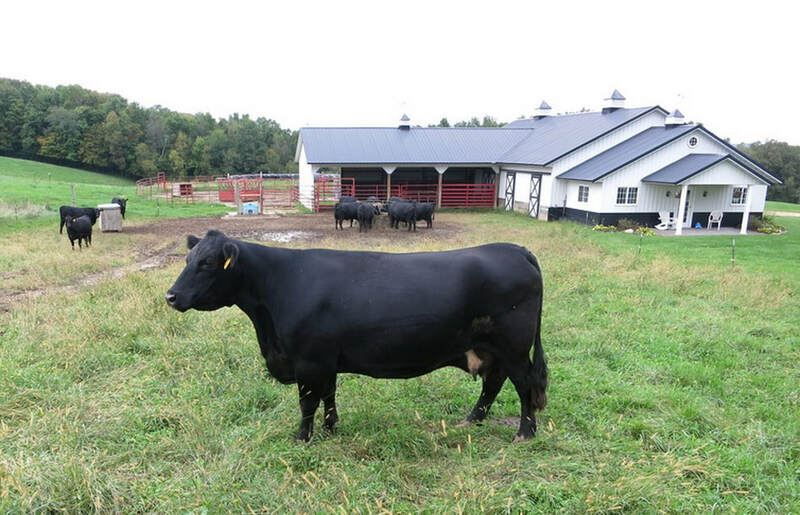 Video: Dam's 1st Calf: Pine Hill China 225W.